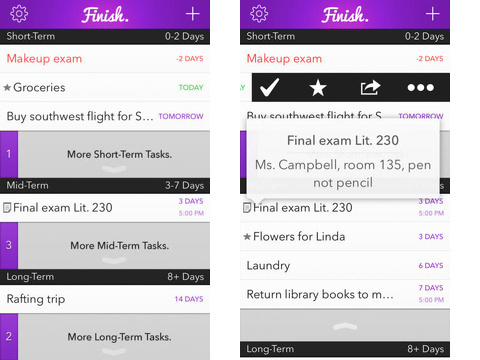 Manage short-term, long-term, and repeated tasks with the Finish. iPhone app. The simple interface and agile gesture controls allow you to customize and prioritize with ease. You earn rewards for completing tasks like coupons and discounts. The Finish. iPhone app is a free download from the iTunes App Store, but you can upgrade to permit unlimited tasks and access enhanced tools. You categorize your to-do list items as short, mid, or long-term. You create the time frame for each category to suit your needs. You touch the wheel icon in the upper left corner of the home screen, and a sliding left menu appears. You select “change timeframe lengths” and tap the up and down arrows. I selected 0-7 days for short, 8-14 days for mid, and 15 plus for long-term. You tap the plus icon in the upper right corner to add a task. You title it in the white field, and you tap the purple background to add notes. It is not a requirement to add notes, but the opportunity is available. You press next on the sliding keyboard to move to the next screen. A calendar fills the top of the screen, and the one-touch options to add to short, mid, and long-term are located at the bottom of the screen. This interface allows you to establish a specific date or a range of time. This flexibility to manage precise times and a wider range of dates enhances the Finish. iPhone app’s appeal. 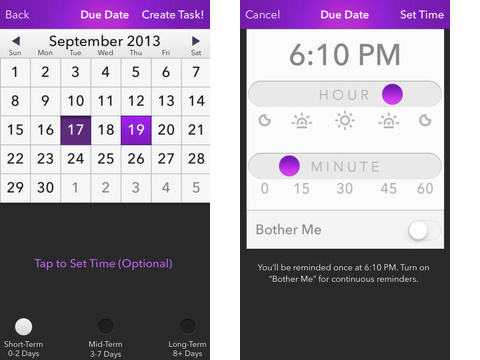 The home screen arranges the tasks by categories. A swipe to the left slides four icons into the task field. You press the check item to complete it. You press the star icon to prioritize it. The share icon opens iOS sharing interface for SMS text, email, Twitter, Facebook, and copy. The icon with three dots opens a screen to add more details. You can edit, add notes, set time (with in-app upgrade), change due date, delete, and repeat. The repeat feature is a critical tool for daily, weekly, and monthly tasks. When you complete tasks, you earn coupons and reward offers. The coupons and rewards were not appealing to me, so I chose to opt-out by changing my settings. The Finish. iPhone app is a solid choice to increase your productivity. The tools to establish firm deadlines and time frames provide a practical, helpful resource. AppSafari review of Finish. was written by Jenni Ward on March 26th, 2014 and categorized under App Store, Free, Notes, Productivity, Utilities. Page viewed 5485 times, 2 so far today. Need help on using these apps? Please read the Help Page. This review is so great, man! Good post about finish review! I was looking for an app to help me with productivity! Thanks for the review!